Summer gives us time to look back and reflect on the hockey season. It gives us time to remember years gone by. It's time to go back and remember some of the most memorable moments in team history. Today we look at the time Mario scored five goals in five different ways. New Year's Eve 1988 started out normal. Penguins were set to take on the New Jersey Devils at the Civic Arena. Little did the over 16,000 plus in attendance that night know they were going to be witnessing one of the most magical acts in a magical career for Mario Lemieux. It started with one goal. A regular even strength goal. Then came the hard ones. Soon followed were a shorthanded goal then the power play goal. The hat trick was his and all three goals had been scored in different ways. That wasn't the end. Next up? A penalty shot. Like there was any doubt he would connect. 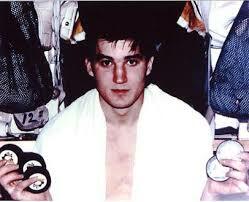 Finally, thanks to the 1980s style of play, with one second remaining he potted the empty netter. A five goal game for Mario. One of only 44 players to this day to do so. His? Unique and historic. To this day Mario's the only person to accomplish this five goals in five different ways feat. Quite frankly this is one record which will probably never be touched again. Join us again next week for Friday Flashback.